First, have they put money into the club? They could not have failed this key test any more comprehensively. 'Not investing a single penny might be considered an ‘ownership crime’ by fans at most clubs but far worse than that they've actually extracted colossal sums from Manchester United. When all interest and charges on their leveraged buyout is added up, plus money they've paid themselves, plus related debt still on the club, they've taken more than £1 BILLION and it’s still rising. No owner in the history of football in any country, ever, has taken so much money from a club. Second, have they successfully handled the appointment of the two key roles of CEO and football manager? Any business owner needs to oversee the appointment of the CEO and then let them get on with the job. It's the same in football except there are two key appointments, CEO and manager. There can be no argument that they utterly botched Sir Alex Ferguson's succession – arguably the most important in the history of the club. It was clearly on the horizon years in advance, but when the time came, incredibly, they allowed experienced CEO David Gill to step down simultaneously. This was completely avoidable at such a destabilising time. They crassly under-estimated Ferguson's genius at working within the tight resources they allowed him, believing David Moyes, with a similar relative 'austerity management' background, could follow smoothly. When the Glazers took over in 2005 we already had an exciting young squad including Cristiano Ronaldo and Wayne Rooney. 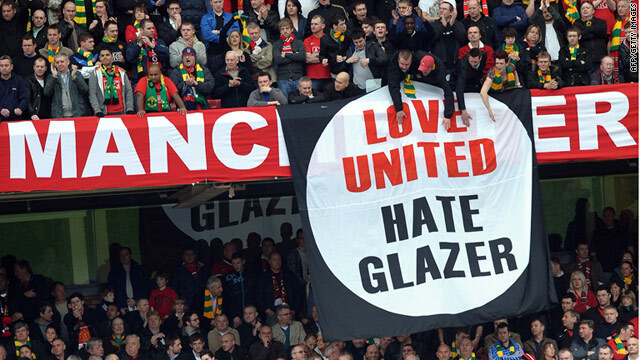 With continued investment that squad should have gone on to dominate Europe for years but the Glazer era squandered that golden chance and although still successful on the pitch it has to go down, in Europe in particular, as a decade of wasted opportunity. United should have knocked Liverpool off their European perch too by surpassing their 5 European Cups. It seems very likely we would have done had it not been for financial austerity imposed by the Glazers’ ownership. The mountain of debt meant fans had to pay, with huge ticket price hikes in the early years, and it also prevented the club from competing for the very best players against the likes of City and Chelsea let alone European rivals Real Madrid and Barcelona. Of course the purse strings have been loosened with major spending in the last 18 months but again this is not them investing their own money. They are simply, once again, allowing the club to reinvest its own revenues in the squad just like a a normal football club! Add to all this the compulsory automatic cup (ticket purchase) scheme, so reviled by many, and zero engagement with the fans. Furthermore with minimal transparency it’s impossible to imagine worse owners. It just happens that Manchester United, unlike many other clubs which have suffered under exploitative owners, was so financially strong that it could withstand the assault. Having said all that – it could have been even worse. Without Sir Alex Ferguson it seems unlikely the club could have withstood the financial strain they placed upon it but he performed miracles. That was starkly illustrated when Sir Alex finally stepped down. Furthermore the scrutiny and pressure created by fans and media coverage also served to protect the club from further damage. If you consider what's happened at clubs like Glasgow Rangers, Leeds, Newcastle and Blackpool it illustrates just how crucial it is to continue to shine the light on the secretive activities of football club owners. The Glazers were in position to take more than £100 million in an additional personal cash “carve out” under a clause they included in their 2010 bond issue. However this triggered the Green and Gold protests and not surprisingly they never exercised that right for fear of provoking an outright rebellion. It’s worth noting also that despite huge rises in the preceding years, season ticket prices have been pretty much frozen since the Green & Gold protests. MUST also held them to account over ticket terms and conditions with a complaint to the Office of Fair trading and went on to, in the face of opposition from their lawyers, register Old Trafford as an Asset of Community Value. Furthermore without such continued pressure Old Trafford would almost certainly have been renamed with a sponsor but, given the ongoing fan pressure, what business would want to create such a hugely negative association with their own brand? These actions by fans and the accompanying media spotlight have all helped to protect the club and that is why the watchdog role performed by MUST remains crucial to this day for both the club and fans. Despite the huge damage inflicted over the last 10 years things are undoubtedly begining to look positive again in 2015. Relations between fans and the senior management team have improved vastly in the last 2 years with genuine dialogue and regular meetings established. The costs of servicing the remaining debt are now down to manageable levels and Manchester United is climbing back to the position of financial superiority it occupied for 9 years prior to the Glazers arrival. It's just a shame we had to go through all the pain and waste of the last decade simply to allow a family with no connection to Manchester United to enrich themselves at the expense of our club and fans. That should never be allowed to happen again to any football club and we will be lobbying Government to act to prevent this in future.